Since I did grab some snapshots while I was in the studio last weekend, I thought I'd better post a brief update before I hunker down for a wintery long weekend in my studio and fall behind on sharing what's happening. After finding a few hours to throw - Saturday? Sunday? - over the weekend, bowls and mugs sat on my shelves for too many days. Finally picked up on decorating the bowls whilst catching up on Krystal's new favorite entertainment phenom, Terra Nova, or as we call it in our house: Dinos! 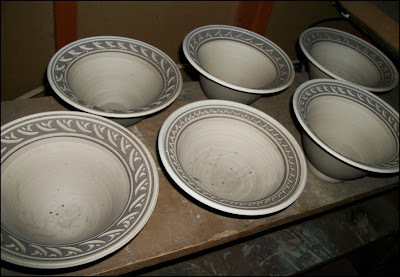 Trimmed bowls Thursday night. 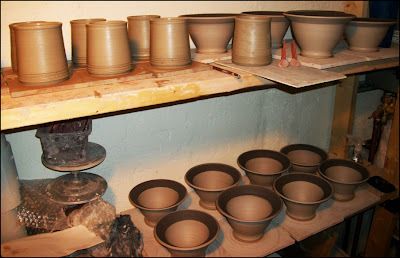 Will be back to throwing this weekend, and hoping my mugs won't reject handles. We'll see. The weekend's work pre-trimming, decorating. Some mugs. Feeling better about these still. Should have been more, but I ran into some chamois remnants that had been recycled with the clay, then shredded, then recirculated. Pulled little bits out of three potential (non)mugs. Bummer, but it happens. Decorated, trimmed, and drying. 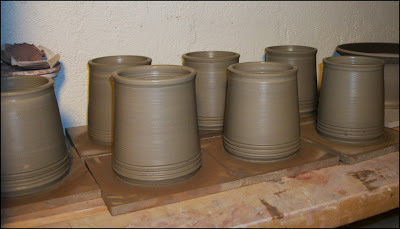 Hoping to get a full kiln of these + mugs + a few other odds'n'ends projects. That's all there is to it, I suppose. Should have plenty of time this weekend to throw, trim, blog, sleep - so there you go. Stay warm, folks! This would be post #199. Bowls and bowl and bowls.